With thousands of vehicles competing for space on our busy streets, pedestrians put themselves at considerable risk on a daily basis. Although there are many traffic laws in place that protect the rights of pedestrians, they are still hit by reckless or inattentive drivers with alarming regularity. Worse yet, children are at increased risk because of their height, or by simply doing what children do, like playing outdoors or exiting a school bus. If you have been injured or a loved one has been killed by a motor vehicle or a bicyclist on public or private property, you have the right to seek compensation. 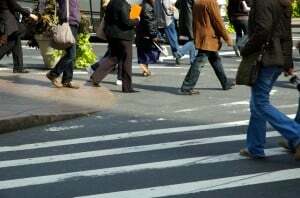 Pedestrians often suffer mild to serious, often disabling, injuries in these accidents, such as fractured bones, spinal cord or disc injury, brain trauma, scars and disfigurement, internal injuries or death. ARDITO LAW FIRM, P.C. works with medical professionals and the victim’s family to make sure we are aware of the full extent of each injury and their impact on the life of our clients. This often includes costly medical bills, continuing medical care costs, the need for household assistance, lost wages and permanent disability. In the event of the death of a loved one, ARDITO LAW FIRM, P.C. can help you with the appointment of a legal representative on behalf of the deceased. Every pedestrian accident is different and must be investigated and analyzed based on the unique facts of each case. Whenever necessary, ARDITO LAW FIRM, P.C. retains qualified investigators and accident reconstructionists to make sure we are armed with all the information needed to obtain the maximum compensation for our clients. Please don’t wait! Although drivers must yield to foot traffic, insurance companies and their lawyers often try to blame the pedestrian. If they succeed, that person’s compensation can be reduced. Therefore, it is essential that you call ARDITO LAW FIRM, P.C. as soon as possible following a pedestrian accident so we can begin working for you.